Peter Clarke, Head Gardener at Ham House, describes the current restoration of the original 17th Century kitchen garden. MAJOR restoration work is underway at Ham House in Richmond-upon-Thames to re-create the original kitchen garden in front of the orangery. National Trust staff are working from original seventeenth century plans to ensure authenticity and the project will carry forward the restoration of the gardens at Ham which began in 1975. The orangery at Ham House is believed to date from around 1670s when the Lauderdales were making improvements to the house and garden. In style the Ham House orangery recalls Dutch classical architecture: the cross bar type windows with small diamond shaped panes have four lights, the upper ones are fixed and the two lower ones can be opened. If built later than the 1670s, it would probably have had tall sash windows. It was built in two distinct phases with a smaller building, the cottage being added later at the west end. Orangeries in the late 17th century were narrow buildings made up of one long open space heated by stoves. Unfortunately the orangery at Ham has not retained any of its original internal features although they were probably not very elaborate. From the high number of citrus trees recorded in the accounts we assume the building was used as a storage place for citrus plants to overwinter. The orangery at Ham overlooks the old walled kitchen garden, situated to the south west of the main house, to the right of the area known as `the plats". (Next to this garden is an area with a Victorian greenhouse attached to the walls of the nearby stables.) The history of the walled garden can be traced back to 1653 when it is mentioned in an inventory attached to lease for the garden. In recent years the beds around the walIs of the garden have been used to grow roses and the garden had become known as the Rose Garden. There are several plans for the original gardens at Ham: Slezer and Wyck (1671), the Helmingharn plan (c1730) and a plan published in the Vitruvius Britannicus in 1739. The Siezer plan shows two buildings to the north of the.garden, although not exactly on the site of the present Orangery. The garden itself is divided into eight blocks by either paths or hedges. Each block is further subdivided into four smaller ones and surrounded by a thin line with dots in the corner of the blocks, thought to indicate planting. The Helmingharn plan shows a similar shape without subdivisions and a rectangular shape cutting the two beds to the west of the garden. The Vitruvius Britannicus plan shows cultivated strips or planting beds within each rectangle and a building similar to the existing orangery. The layout of the restored kitchen garden has been based on the Slezer and Wyck plan to give continuity to the original restoration carried out in 1975. The new garden has been divided into 16 compartments with gravel paths between them, rather than the 32 shown on the plan. There have had to be some compromises over the use of the area as for many years it has been used for marquee receptions; this will continue at the lower end of the garden. The orangery is now used as a restaurant and the terrace has been extended for visitors to enjoy their tea. We only plan to cultivate 8 plots for the foreseeable future. The garden will be run on organic principles and it is intended to use the oldest varieties available and to build up a collection of heritage vegetables. The vegetables and flowers grown will be used in the restaurant and house. A schedule and inventory of fruit trees and other trees made on 10th September 1653 which lists 'Standings groweing and reneweinge in the gardens wilderness and grounds demised by the indenture of lease to which the schedule is annexed unto Samuell Purnell gardiner by Sir Lyonell Tolemache and John Peirson"
This schedule records the west side of the wall in the kitchen garden with "2 vynes, 9 peaches, 6 peares and 10 peares where the wall has fallen downe, 1 cherry tree, 16 apricocke trees"; the orchard in the kitchen garden with "in the first Rowe of trees next to the walke 12 apple trees and one cherrie" (the list continues to seven rows); and the nursery with "89 stockes of peares, cherries and apples redied grafted. 16 rodd of Hatihoakes redie planted, 16 rodd of sparrowgrass planted". Part of the inventory of the Duke's goods after his death, drawn up between 25th October and 12th December 1682, which lists '8 large orange trees and lemon trees, 22 smaller orange and lemon trees in tubs 32 orange and lemon trees in potts (and) 11 great tubs with myrtles and several pots with greens"
from 1693 lists of 11 ye trees and plants, flowers and potts such were delivered to John Balesson Your Grace's gardener about middle of June 1693". Further research needs to be carried out on cultivation methods for a kitchen garden of the late 17th century. IN the seventeenth century meat and game of all kinds were the central component of the dining table and tastes were more catholic than today: even songbirds like larks might turn up baked in a pie. Salt and pepper were expensive and in short supply, so dishes were seasoned with mustard, cloves and mace and garnished with lemons and capers. Vegetables formed a less significant part of the diet than today and the diarist Samuel Pepys rarely mentions them despite listing his meals in detail. However Pepys lived in central London with less access to fresh food than country dwellers. Most common English varieties of vegetable were grown: cabbage, leeks, onions, cauliflower, spinach, endive, carrots, turnips, parsnips, beetroot, artichokes, mushrooms, peas and beans. Potatoes were still relatively new. Salad vegetables included lettuce, celery, cucumber and radishes. Plants and herbs were also grown for their medicinal properties. Globe artichokes for example were believed to protect the liver and lower blood fat levels, while sage was thought to aid digestion - probably essential for diets so high in fatty meat and low in roughage. Fruit was very popular including apples, pears, quinces, melons, strawberries, cherries and soft fruit like gooseberries and apricots. In 1664 the northern end of Hyde Park was fenced off to create an apple orchard for the Royal Household. Citrus fruit was grown by the wealthy in purpose built "orangeries" which were heated in the winter. Scented flowers and shrubs were popular including rosemary, lavender, gillyflowers, musk roses, lilies, violets, honeysuckle, cornflowers, cherry and apple blossom and columbine. There was also a mania for tulips in the 1660s. HAM House, sited on the banks of the Thames at Richmond, is one of the best �preserved seventeenth century houses in England. Originally built in 1610, it was remodelled in the 1630s by William Murray, former "whipping boy" to Charles 1. Shortly after Civil War broke out in 1642 Murray was created Earl of Dysart and spent much of the war away on missions for the King leaving his family at home at Ham House. In 1648 Murray's eldest daughter and heiress, the red-haired, sharp-witted Elizabeth, married Sir Lionel Tollemache of Helminghall Hall in Suffolk. Despite having eleven children in the next twenty years, Elizabeth still found time to be a leading member of the Society of the Sealed Knot (dedicated to the restoration of the monarchy) and during the Protectorate was rumoured to be on intimate terms with the Protector himself Oliver Cromwell. Elizabeth inherited the Ham estate in 1655 and after the Restoration became a prominent member of Charles ll's court. In 1669 her husband died and in 1670 the King conferred her father's titles on her making her Countess of Dysart in her own right. In 1671, at the age of 46, the Countess took a new husband John Maitland, Earl (later Duke) of Lauderdale, a leading member of the notorious CABAL government. He was a former Scottish Covenanter who had changed sides in the Civil War. 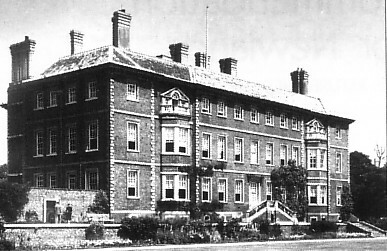 The 9th Earl of Dysart died in 1935 and Ham House passed to a second cousin, Sir Lionel Tollemache, who, with his son Cecil, gave the house to the National Trust in 1948. In 1975,1he NT undertook a major restoration of the gardens, based on contemporary plans. BEYOND the lawns.to the rear of Ham House is an area known as the Wilderness. Danckert's painting in the white closet at Ham House shows classical statues in the centre of the Wilderness and the inventory of 1679 records: Tenn Statues of lead whereof two upon stone pedestalls". These ten statues are clearly those painted by Danckerts on his visits to Ham in 1675. The National Trust has successfully applied for funding to replace four statues and a further six bases. The two statues at the Wilderness entrance were Venus Marina and Mercury. No life size versions of Venus are known to exist so the Trust has kindly been given permission by the Queen to take a cast from Hampton Court. Mercury will be cast from the owner's statue.